The goal of this series is to help our readers better understand weather terminology they hear from news, radio, and internet sources. In Part 1, we discussed severe thunderstorms and tornadoes. Today, in Part 2, we will share information about tropical storms and hurricanes. Tropical Depression: Weather conditions are favorable that sustained winds of 38 mph or less are likely to develop in or around your area within the next 48 hours. Tropical Storm Watch: Weather conditions are favorable that sustained winds of 39 to 73 mph are likely to develop in or around your area within the next 48 hours. You want to be aware of what is going on around you as conditions may change significantly. Have quick access to weather reports and/or your weather radio during any tropical storm activity. Tropical Storm Warning: Tropical storm conditions are expected to approach your area within the next 36 hours. You need to take precautions in the event the storm should increase in intensity. Adhere to the instructions by your local authorities about the possibility of evacuation. Have quick access to weather reports and/or your weather radio during any tropical storm activity. Hurricane Watch: Weather conditions are favorable that sustained winds of 74+ mph are likely to develop in or around your area within the next 48 hours. You want to be aware of what is going on around you as conditions may change significantly. Adhere to the instructions by your local authorities regarding evacuation. Have continuous access to weather reports and/or your weather radio during hurricane activity. Hurricane Warning: Hurricane conditions are expected to approach your area in less than 36 hours. You need to take immediate precautions as the storm increases in intensity. 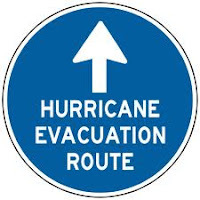 Adhere to the instructions by your local authorities regarding evacuation. Have continuous access to weather reports and/or your weather radio during any hurricane activity. For more information about severe thunderstorms and tornadoes, please click here to visit the Storm Encyclopedia on the Weather Channel's website. Disclaimer: Practips provides this for informational purposes only, and cannot be substituted for the advice of the National Weather Service or your local authorities should severe weather occur in your area. OK, so I'm completely dumb, but I had no idea that the wind was the differentiating factor between all of these. You learn something new every day!